Recently, the theme of courage and confidence has come up for me more than once. Those were the words that came to me at a Pinnacle View women’s retreat in September, when I was asked “What is your intention for this weekend?” Courage and confidence were what I wanted to tap into, so I could carry them into the coming months. Courage to take a break from performing and confidence that I would get booked again. Courage to take on the biggest musical project of my life – recording a CD of my original songs – and the confidence to pursue it with the knowledge that I’m doing what I love and I’m ready . Just before Christmas, a friend asked me to write my wish for the coming year on a tag that she would hang on her “wish tree.” I chose to remind myself of those two words again. And then, my daily planner used the same two words in its weekly reminder, on the very week I’m to start recording. 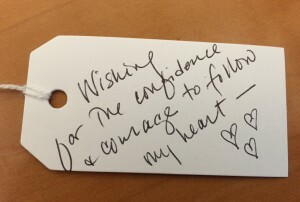 Clearly, “courage and confidence” is going to be my mantra for 2016! In December, I was invited to appear on WHUP FM’s Pass the Hat, hosted by Bob Johnson and with fellow guest Dean Driver. The show is archived, and there are a couple of videos: “Fear and Wanting,” and one of my latest, “Hold Her Like Sand,” inspired by a comment the mother of an old boyfriend of mine made to him when he and I dated back in high school. Songwriting inspiration is everywhere! Leading up to Christmas, I was feeling a little melancholy, missing my family and especially my mother, who passed away almost 10 years ago. I found myself on Christmas morning writing and finishing a song in a couple of hours, something that does not often happen for me. “Christmas Morn” (or maybe “Christmas Sunrise”) will end up on my second CD (that’s confidence talking!). So…another year of performances is winding down. 2015 has been tremendous fun, with music- and friend-making, and growth in my songwriting, performance, and even guitar skills. 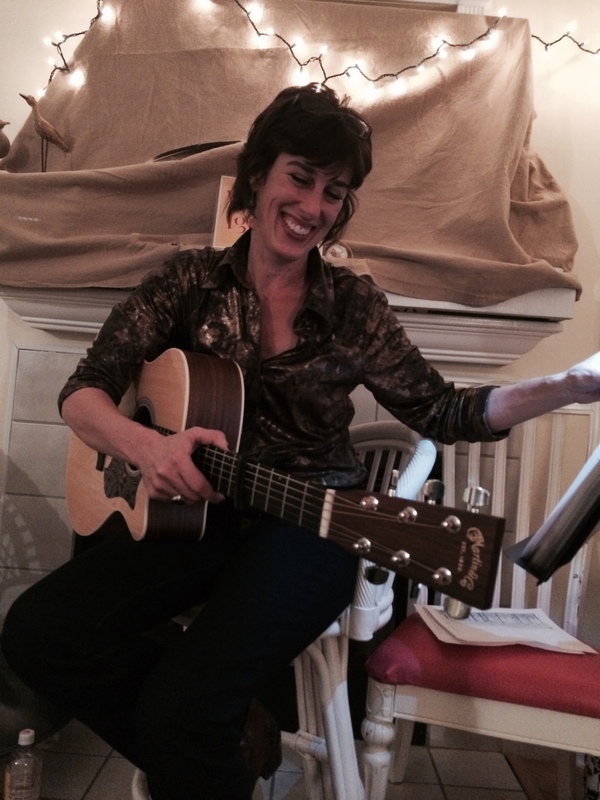 I am so grateful to be part of our musician community and to share my passion for singing meaningful songs. 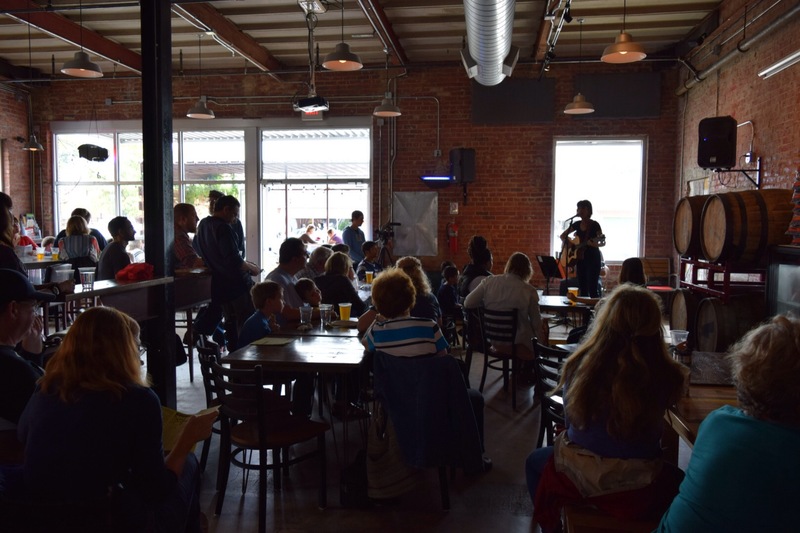 These photos were taken at the Carrboro Music Festival, where Joshua Cohen and I played an almost-all originals set (we perform a jazzy version of “Somewhere Over the Rainbow”). 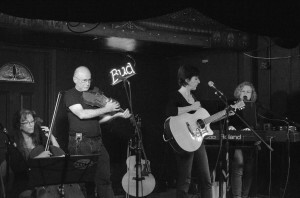 The beauty of playing the Festival is that the audience really listens – the schedule is packed with great acts all day, and there’s a lot of musical variety to choose from. We had a really nice turnout of friends and newcomers. We made some new friends! 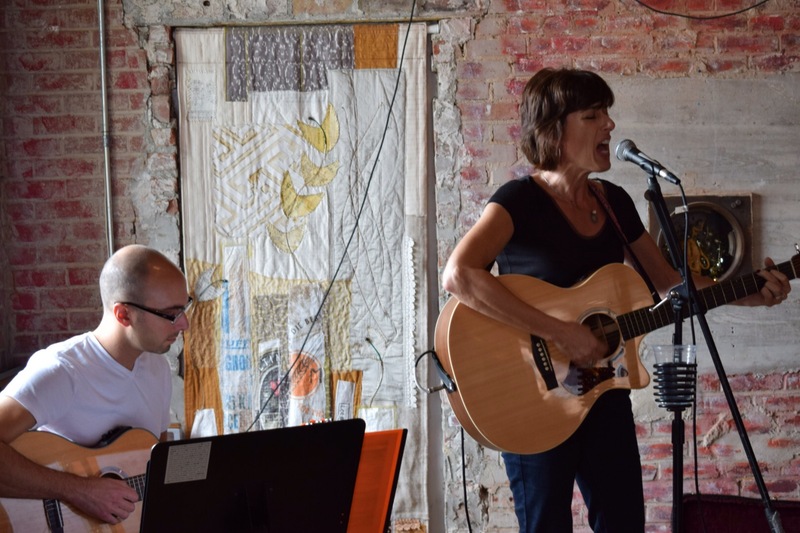 I have a couple of bookings in October (see Dates), and then, as in the past, I will likely take November and December off from performing to focus on other things – family, songwriting, and…working up my songs for my first ever CD! More details on that as they develop – suffice it to say that I’m extremely excited to take this next step in my music career. Thanks for following along and supporting me on my journey! 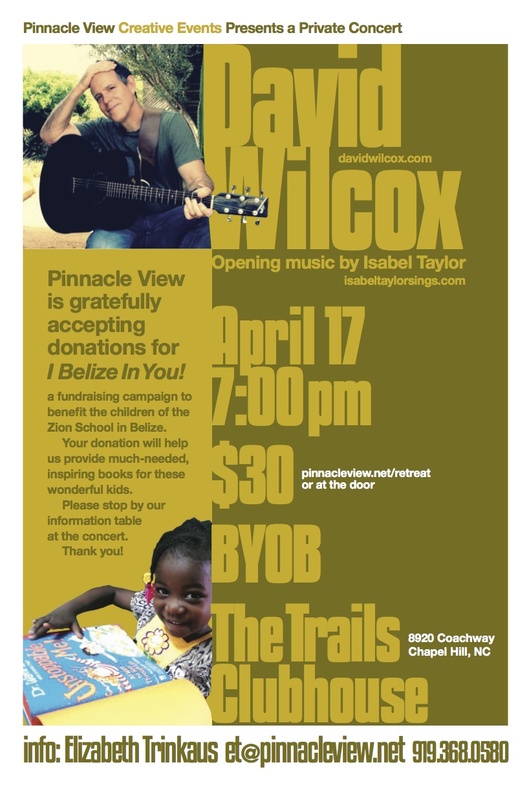 Last weekend I had the great pleasure of meeting singer-songwriter David Wilcox and playing a few of my songs for the intimate crowd gathered for Pinnacle View‘s “I Belize In You” benefit event. The benefit raised funds to send inspirational books to children at the Zion School in Belize, where children regularly go without school supplies that we consider basic. 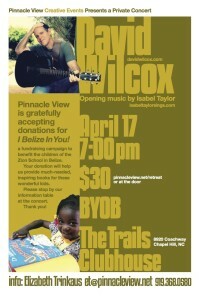 I’m so excited to have been invited by my dear friend Elizabeth Trinkaus to sing a few opening songs at a very special concert this Friday in Chapel Hill featuring Asheville-based singer-songwriter David Wilcox! A portion of the proceeds will support I Belize In You, Pinnacle View’s program to provide inspirational books to children in Belize. Tickets may be purchased online or at the door. Please join us! 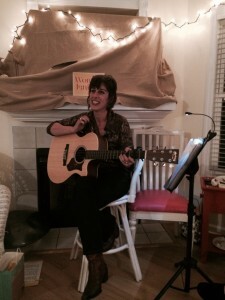 I recently had the great pleasure of performing at a private event — a beach retreat — sponsored by Pinnacle View. The audience was small and intimate — about ten women in all, seated within a few feet of me, all very present and attentive. The evening was a mixture of performance, story-telling, and sing-along, full of laughter and joy. There were even a few tears (mine!). Engaging with an audience that way was an entirely new experience, and one I found immensely rewarding. If a house concert is anything like this, I see one in my future. 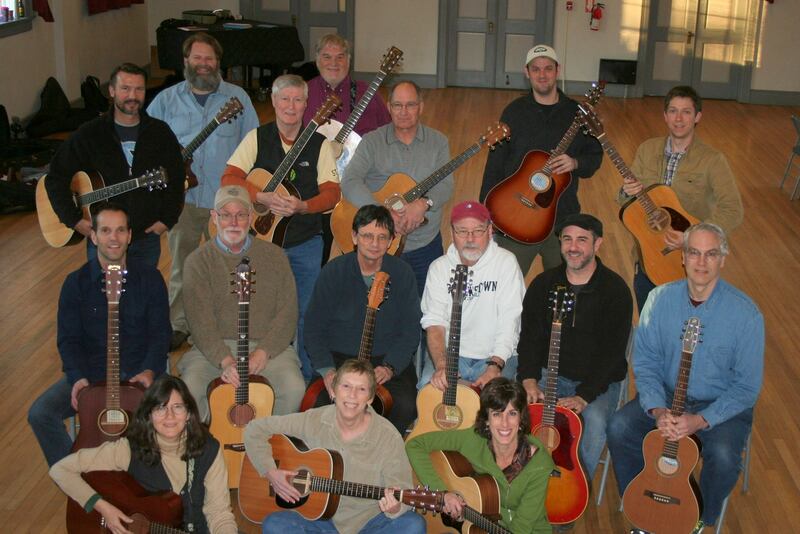 Last month I had the pleasure of participating in a weekend-long guitar camp led by patient and talented instructors Rolly Brown, Danny Gotham, and Jon Shain. I’ve been wanting to improve my guitar skills, and this camp was the perfect way to expose myself to more music theory and techniques. I’m working hard to incorporate what I learned into my songs. I think my favorite aspect of the camp was connecting with a community of musicians and making new friends. I’m already looking forward to next year’s camp. 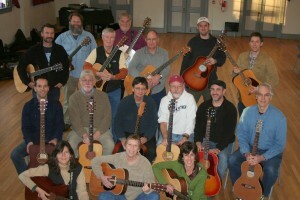 With instructors and fellow participants at the second annual Great Guitar Camp in Durham, NC. Please check my Dates page to see where I’m playing next. 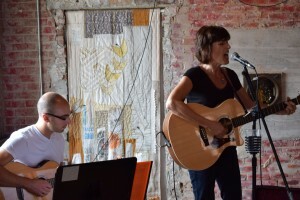 I’ve been doing a lot of solo gigs in order to focus on improving my performance, but I’m teaming up with Tom Ed White on Feb. 28 for a show in Cary. If you’re not on my mailing list, please join for more frequent updates. There are some exciting things coming up! What a busy few months we had between June and October! Twenty-one performances, solo and group, indoors and out. We keep getting better and having more fun as we do. Last night was our last group gig of the year at The Goat at Fearrington Village, and we went out with a bang. Unplugged, up close, and uptempo. We couldn’t have asked for a better closer. The next couple of months will give me time to record some of my new songs, get back to doing open mics (great venues for debuting songs), improving my guitar skills, and writing more. As the year is winding down, I’m again (really, still) feeling grateful for all the opportunities this year, for the growth of the band both in number and skill, and for the continued support from fans, friends, family, and especially my husband, Keith. I’m especially grateful to Tom Ed White, Cara Bonnett, and Janet Hadler for all their contributions and dedication. I look forward to 2015 and know it will be another year for growing musicianship, building relationships, and even more new experiences. Here’s to that! This past week was full of music-making opportunities! We played the Pittsboro Roadhouse, the Hillsborough Farmers Market, and the Duke Homestead Bullfest, two of which were on the same day! Cara and I have a new song in the works, Janet is joining us on cello on more and more songs, and applications are out for some outdoor festivals in the fall. I couldn’t be happier! Spring is providing so many opportunities to play the music I love! 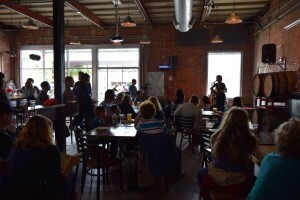 Our first group gig of the year was on the NC Songwriters Co-op stage at the Durham Art Walk, followed by a great night at The Kraken Bar, with a wonderfully attentive crowd. 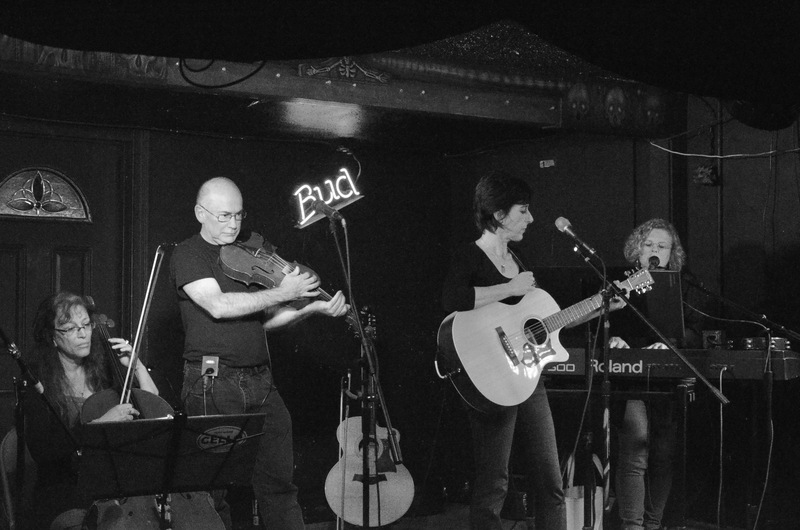 That night was made extra-special by Janet Hadler, who joined us for a few numbers on cello. And Mother’s Day found us all at unWINEd, a lovely spot, indeed. I’m still trying to carve out time to write and record — the song ideas keep coming! In the meantime, I’ve posted videos of both group and solo performances. More dates to come, both in the Triangle and at the Crystal Coast — hope you’ll come and say hello!